Route: View in Google Maps. GPX File: Download GPX file (desktop only) – What is a GPX file? 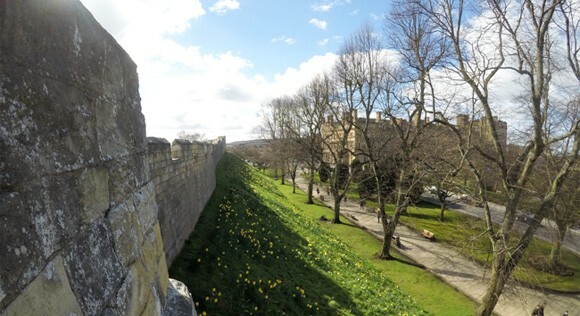 The York walls were erected by the Romans in AD71, improved by the Vikings from AD867 and upgraded to stone in 1226. In 1800, the stone walls were no longer needed to defend the city and York City Council requested the walls to be torn down to help the city expand. A public resistance saw the survival of the walls providing one of York’s best free attractions. The York walls are open from 8.00am each morning and close at dusk. The closing time for each month is available on York City Council’s website. The walls are closed on Christmas Day and during icy/slippery conditions. 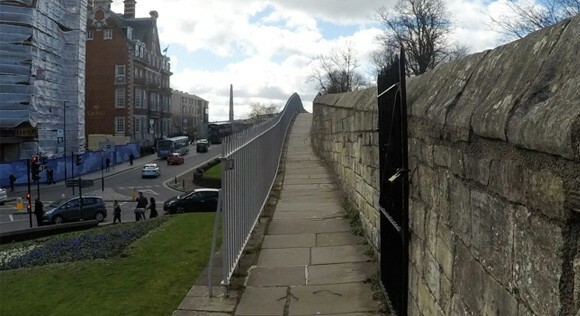 Due to steps along the York walls, there is no disabled access. Dogs are not permitted on the walls. 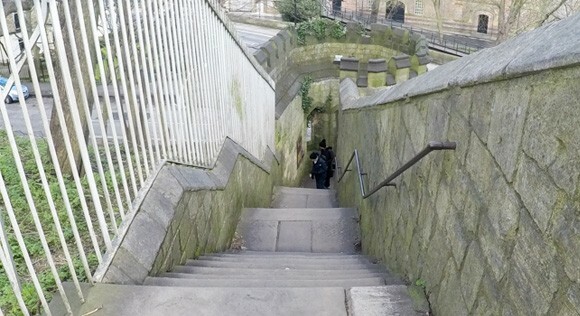 The York walls pathway is a gentle walk with some stairs. There are plenty of benches to rest along the way. 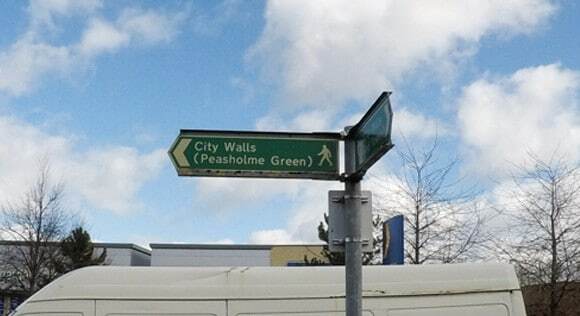 The walls are often busy with walkers and the narrow paths can become crowded. The York walls route is circular. You can start the walk wherever is convenient. 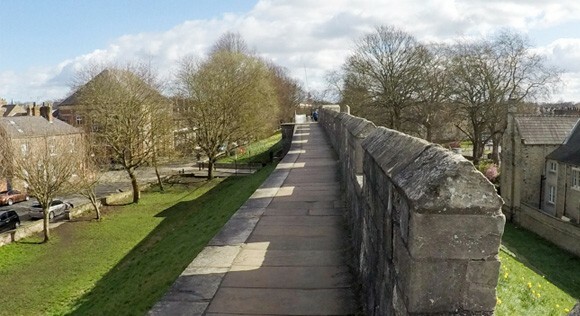 This guide starts at Barker Tower on Lendal Bridge – it’s close to the train station, starts on the River Ouse and finishes in Museum Gardens. The York walls route is simple to follow. 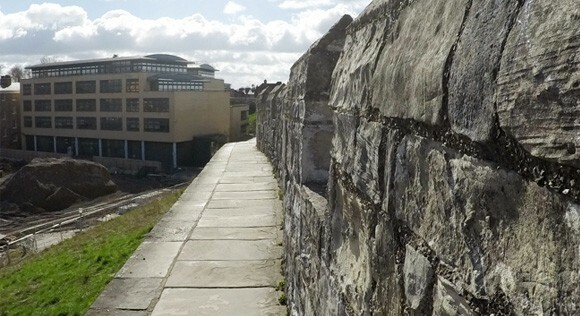 You walk along the footpath at the top of the walls, overseeing York city centre along the way. There are short gaps along the York walls route. In some areas the walls were destroyed and in other areas defensive walls were not required because the area used to be protected by water. The “bars” along the wall are main gates which used to be used for an entrance into the city. There were four prominent bars used as defensive towers and access points for traders. One for each direction of the city – Bootham Bar, Monk Bar, Walmgate Bar and Micklegate Bar. From Lendal Bridge you can see Barker’s Tower. Within Barker’s Tower sits a little coffee shop, Perky Peacock, and the York walls walk starts around a small corner. 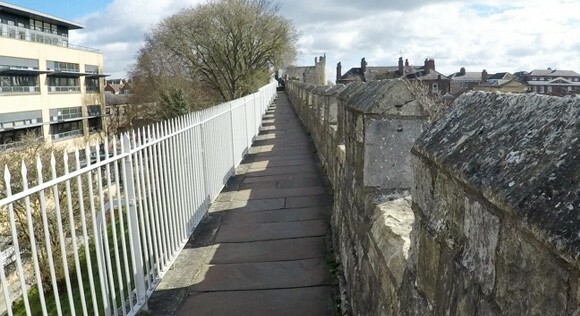 The gradual incline sets you atop of the York walls quickly and provides a good vantage point. Keep walking along the footpath until you reach Micklegate Bar. Micklegate Bar served as the main entrance to York for over 1000 years and was even used to display traitor’s heads on spikes as a warning to others. 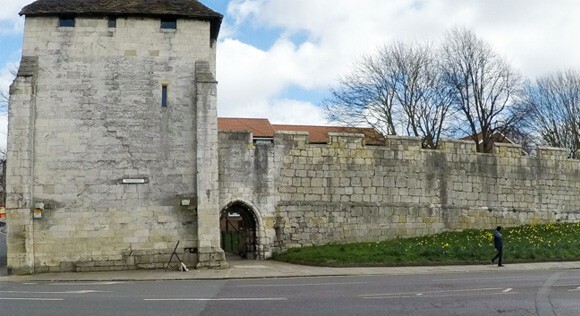 Within Micklegate Bar you can visit the Henry VII experience to learn about Richard III, Henry VII, War of the Roses and the final Battle of the Bosworth. If you don’t want to visit the experience, keep walking past the entrance leading on to the next section of the walls. You will walk directly over Victoria Bar. Victoria Bar was opened to reduce congestion at Micklegate Bar. 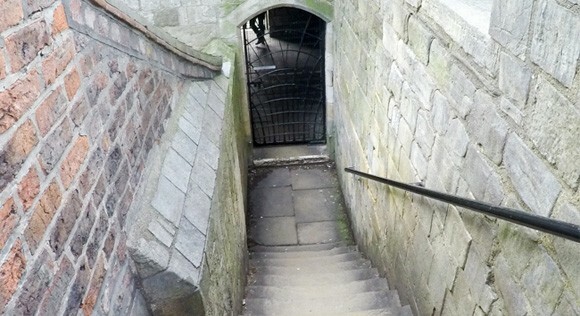 The traffic was constantly backing up at Micklegate Bar and Victoria Bar provided an alternative entrance to York. The next checkpoint is Baile Hill. 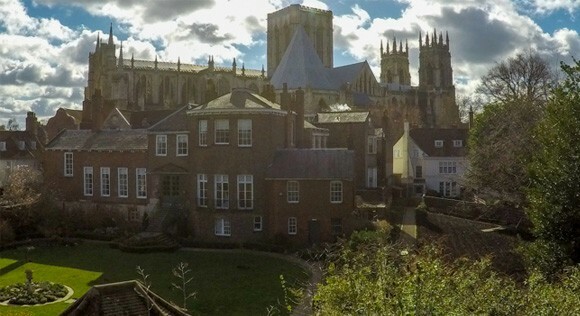 Baile Hill was commissioned by William the Conquerer in 1069 to defend York from rebellions. 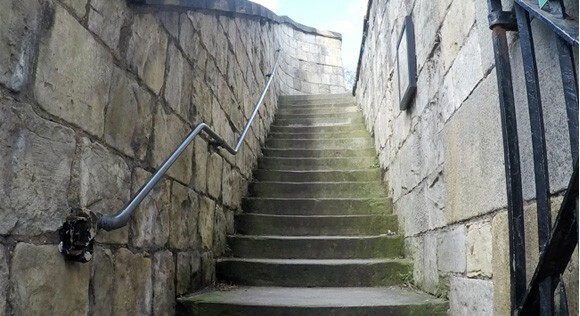 Stairs lead you down the York walls for the walk to Skeldergate Bridge. There are no walls at this section. In 1807 a large gateway next to Baille Hill was removed to improve the flow of horse-drawn traffic into the city and the remaining walls were demolished to build Skeldergate Bridge in 1878. 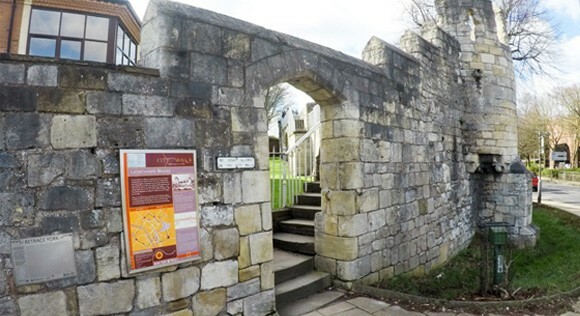 Walk over Skeldergate Bridge, cut through Tower Gardens and head for Clifford’s Tower. Clifford’s Tower is an iconic section of the York Walls and York City Centre. There is a cost to enter Clifford’s Tower and see the views atop of the tower. 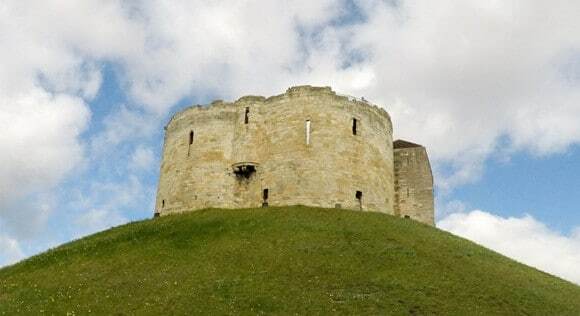 Within Clifford’s Tower you can learn more about the history of York. After your visit to Clifford’s Tower, head back to the main road towards the roundabout. 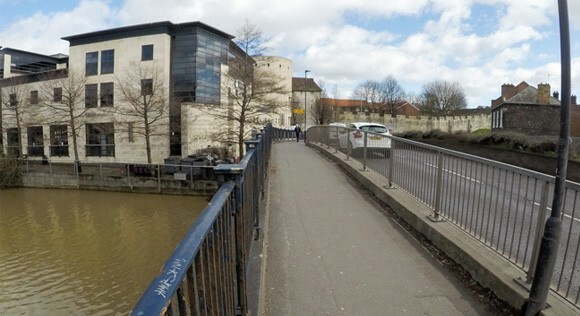 Cross over the River Foss until you reach Fishergate Tower with stairs leading you back on to the York Walls. The path leads from Fishergate Tower to Fishergate Bar. In 1489 Henry VII raised taxes, to the dismay of the general public. An angry mob set fire to Fishergate Bar in protest. You can still see the scorch marks in the archway today. 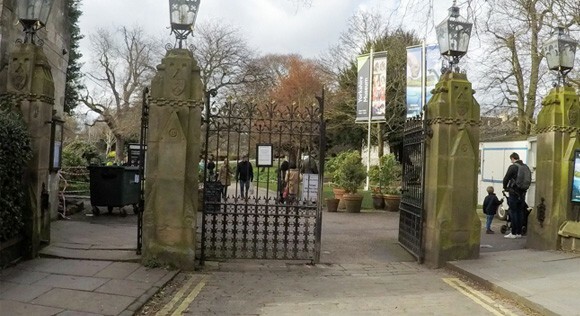 The next set of gates along the wall is Walmgate Bar. 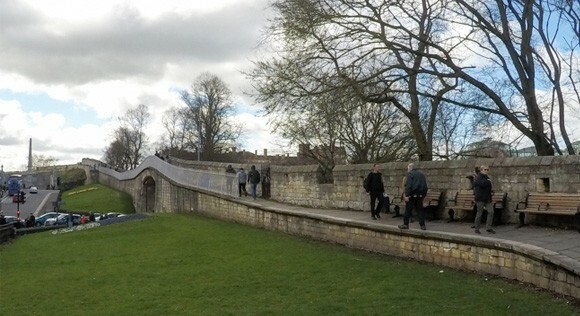 Walmgate Bar is the most complete bar along the York walls. The barbican is still present – a barbican is an extension from the main gate, creating a tunnel. Enemies become trapped between the two gates in a vulnerable position. 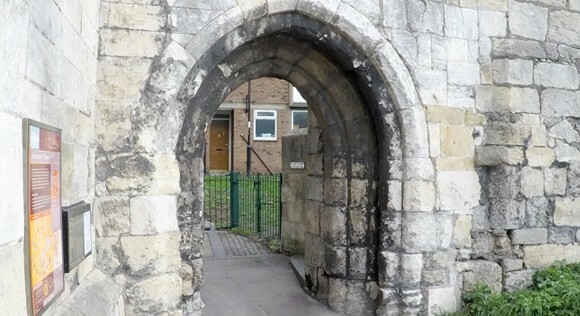 The four main bars at York all had barbicans at one point in their history, but only Walmgate barbican remains. Walmgate Bar was under heavy fire during the civil war in 1644. If you look carefully you can still see markings from cannonball fire and bullets. Continuing the walk leads to the Red Tower. It’s name derives as the tower was built from brick, rather than stone like the rest of the York Walls. This area used to be flooded after William the Conquerer dammed the River Foss, creating “The King’s Fishpool”. No further walls were required as King’s Fishpool covered the area from Red Tower to Layerthorpe Bridge. Edible York has positioned one of their Edible Gardens at the Red Tower. Local schools and volunteers plant fruit, veg and herbs at the gardens. Pick a little bit of mint, basil, coriander or whatever else is growing in the bed. 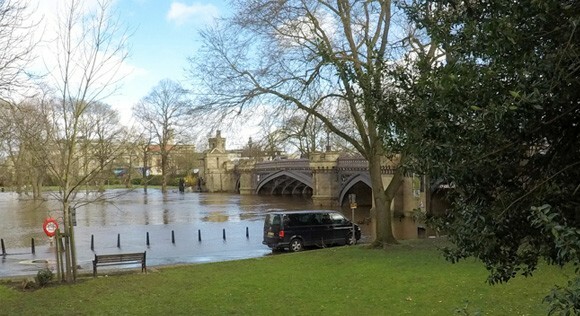 It is a 5-minute walk from Red Tower to Layerthorpe Bridge. Follow the River Foss passed Foss Island and cross the junction. The walls continue through an archway and up the stairs. It’s a short walk from Layerthrope Bridge to Monk Bar and the pathway is narrow along this section. Monk Bar is named after the monastic community that lived in the surrounding area – now the present day Minster. Monk Bar is the strongest and tallest of the four main bars along the York Walls and has 4 floors, with defenses such as murder holes to protect each floor independently. Monks Bar still has a working portcullis (a big metal gate that is lowered to close access). 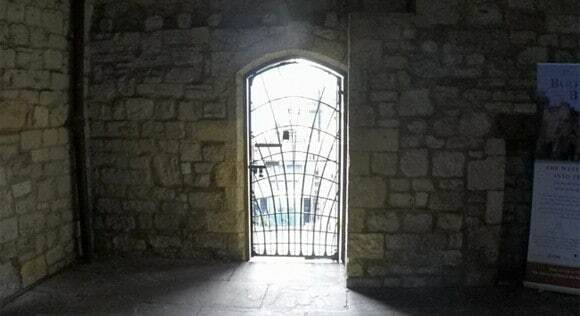 The portcullis was last used in 1970. Walk down the stairs to view Monk Gate from the front. 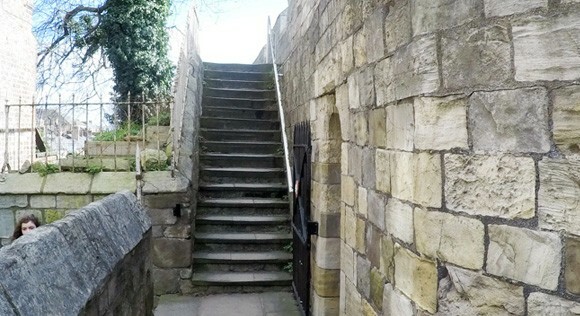 The stairway is inside the stone wall and leads you to the next stage of the York Walls and to the Richard III experience. The walk between Monk Bar and Bootham Bar provides the best views of York Minster. 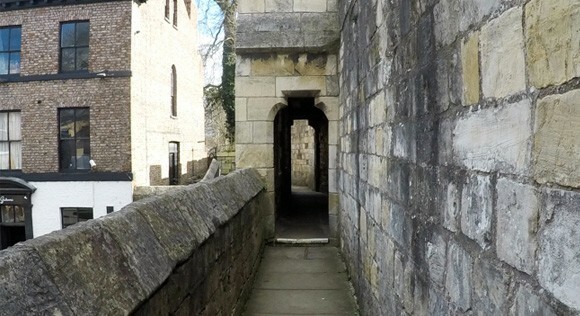 There is a gate leading to a large room inside Bootham Bar, with another gate exiting down the stairs on to the Main Street. More walls can be seen across the street from Bootham Bar. Initially the walls were linked, but the connecting wall was demolished in the 19th century. The fortifications didn’t protect the city like the majority of the York walls, but protected the Abbey of St. Mary. The remains of the grand Abbey church can be seen in Museum Gardens. Bootham Bar leads to the main road. Follow the road, passed the York Theatre Royal, and turn right at the traffic lights. Follow the road passed the library and to the Museum Gardens. You have finished the York City Walls Walk!